Darlington Football Club are delighted to announce the appointment of Tommy Wright as the new first team manager, with Alan White as his assistant. Tommy, 33, will be starting his third spell at the club, having had two previously as a player. He appeared for the club in the victorious FA Trophy final in 2011 in his second spell, and in total made 76 appearances for Quakers, scoring 21 times. After his second time at Quakers, the former Leicester and Barnsley player went on to appear for Corby Town as player-manager, helping them to win promotion from the Southern League to the National League North in 2015. He was appointed Nuneaton manager last season when they were near the bottom of the table, and helped them to a midtable finish. Ironically, his last game in charge of Nuneaton was a 2-1 home win over Quakers last Saturday. 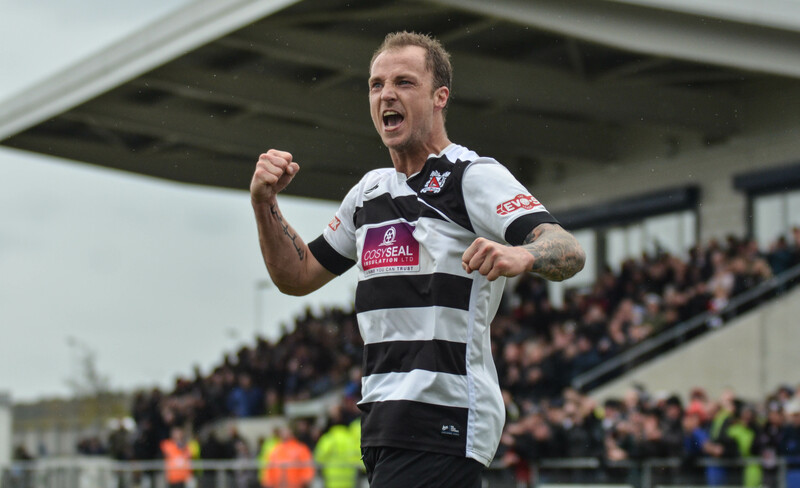 Tommy’s assistant will be Alan White, who has had three spells as a player with Darlington making over 100 appearances, and was player/coach when Quakers won promotion from the EvoStik First Division North and coach in the EvoStik Premier League championship season. Alan has extensive experience in the Football League, and has been coaching at Spennymoor Town for the last two seasons, helping them into the National League North. Tommy says that he is eagerly looking forward to meeting the Darlington fans again. “This was a great opportunity for me to come and manage a massive club that should still be in the Football League and one that I love so much. “The directors talked to me about their vision for the club, and Alan and I really want to help realise that. We believe that we can deliver what they want, and that is success. “The fanbase is massive, with regular crowds of between 1800 and 3000, and potentially more. I always had a very good relationship with the fans in my two playing spells, and that was a key factor in my decision to take the job. I was quite upset when I left after my first spell for Aberdeen. I didn’t want to go, but the club needed the money at the time, otherwise it would have gone bust. The second spell, of course, was highlighted by the celebrations of that great FA Trophy win at Wembley. “I felt very emotional last season when I returned as manager of Nuneaton and the fans gave me such a warm welcome back. I will always remember that. Tommy has kept in touch with Alan since they played in the same Darlington team ten years ago. “Alan has plenty of experience, and he will be an ideal person to have beside me and help me do the job. Tommy and Alan will introduce themselves to the players before the game on Saturday, before watching the game away from the technical area. We would like to warmly welcome Tommy and Alan back to the club, and urge the fans to give both of them their 100 per cent support, beginning with the home game against Bradford Park Avenue on Saturday.